Kitchen islands are a staple of almost every kitchen big enough to fit one, and are largely considered the stylistic heart and anchor of a well-built contemporary space. But there’s one element that almost every island has that rarely gets talked about: the bar stools. Most islands are designed with seating in mind, which means they have to come paired with something to sit on. Bar stools are a relatively small-ticket purchase, so they often go overlooked, but used right, they can have a big impact on the look and feel of your space. Why Do Bar Stools Matter? 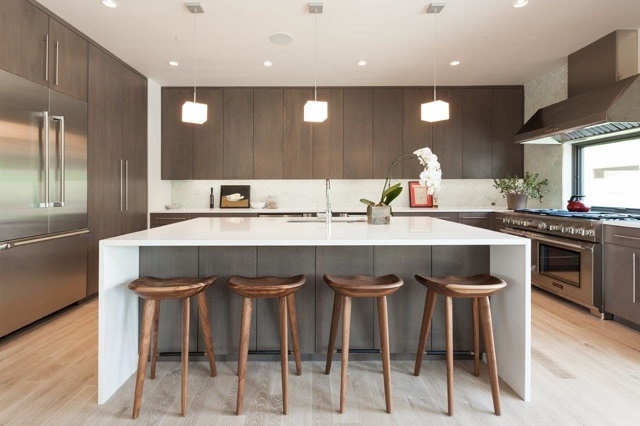 Island bar stools have a proportionally greater-than-average impact on your kitchen design for one simple reason: visibility. Because most islands are designed with seating that faces into the kitchen, the bar stools are placed front and center, and are the first and most prominent thing you see looking into the kitchen. So while your bar stools are primarily functional – and of course should be comfortable to sit in – if you’re treating them solely as a utilitarian element and ignoring their decorative potential, you’re wasting a lot of highly-visible design real estate, not to mention a good chance to add a little personality to your space. If your kitchen already has a distinctive aesthetic, choosing bar stools should be a no-brainer – you just want to opt for a style that underscores and emphasizes the design elements you already have going on. 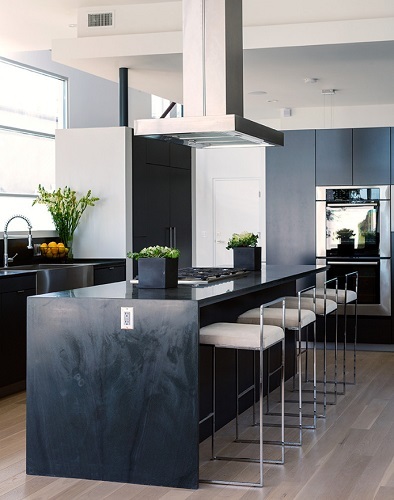 What that means, of course, will vary from one kitchen to another, but if your space is all modern, geometric blocks of black, white, and gray, you want similarly angular, modern bar stools. Matching a specific style or time period, or even just repeating shapes and colors can help round out your kitchen and give a much more polished, complete feel than a set of generic counter chairs. That said, you can also use bar chairs to give your kitchen an entirely different look. 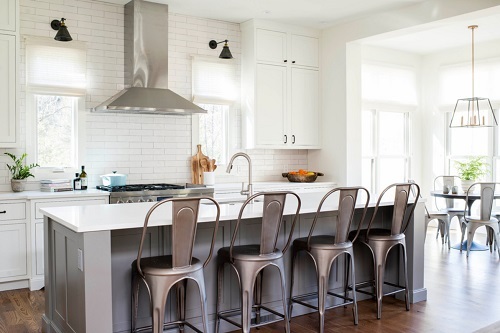 Because of their prominent placement, swapping out your existing bar chairs for a new set is a surprisingly effective way to spruce up your kitchen without committing to a more extensive remodel. 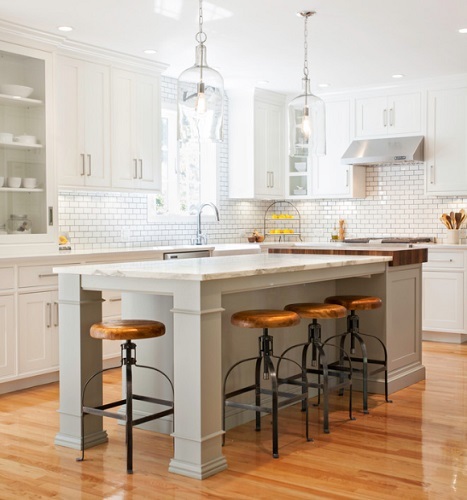 For white kitchens in particular, very distinctive bar stools can totally alter the atmosphere of your space. Reclaimed wood and iron factory stools will give your space a strong industrial feel, while cross-back or bent-wood stools will play up a farmhouse feel, and modern chrome or molded plastic chairs will give your space a more modern look. If you’re decorating a large, open greatroom, bar stools can also play a vital role in helping to coordinate your space. Since all of your furniture is going to be more or less visible from everywhere in a barrier-free space, choosing matching bar chairs and dining chairs can help give your greatroom a nice sense of unity. Alternatively, if you’re having issues with a greatroom feeling a little too open for your tastes, choosing markedly different bar chairs and dining chairs can aid in making the different areas of the room feel distinct and divided, even without any physical barriers. There aren’t a lot of good ways to add color to a kitchen, but opting for colorful bar stools is one of them. While paint, backsplashes, and other accessories are all limited by the amount of space you have for them (whether it’s too little wall space due to cabinet placement or just a lack of counter space), bar stools have that unique, prominent placement that means they have a bigger impact than you’d expect, especially when you choose ones in a really bold color. This is also a slightly more affordable (and less permanent) option than having a brightly-colored island; while you end up with a little less total color, the impact is similar, and you still have the option to switch to a new color scheme later. Last but certainly not least, bold, designer bar stools are a surprisingly great way to make a stylish statement. Most bar stools are pretty utilitarian by default, which is part of why nice ones make such an impact, and means that really unique chairs come with a lot of built-in wow factor. Bright colors, unique designs, or unconventional upholstery all make a chair stand out dramatically in an otherwise average kitchen. More chairs will multiply the effect, but even if you only have a single-seat island, one bold chair is plenty to help wake up your design and give your kitchen a fresh, new feel. 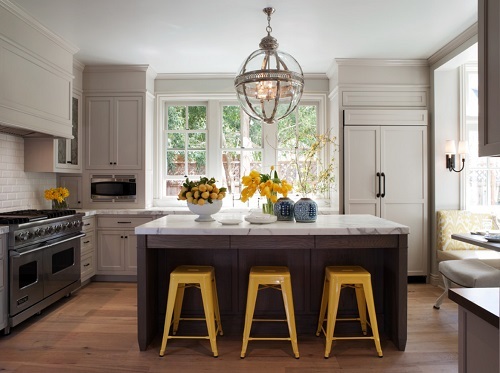 Bar stools are probably pretty low on your kitchen remodel to-do list, but spending a little extra time and money to find a set that accentuates your kitchen can have as much impact as much bigger-ticket items, with only a fraction of the headache. This entry was posted in Decorating Ideas and Tips, Dining Room Furniture and Decor, Kitchen, Latest Trends and tagged bar chairs, bar stools, counter chairs, counter seats, Kitchen Design, Kitchen Design Ideas, Kitchen Islands, kitchen seating.